Autumn Sunrise overlooking Jordon Pond from North Bubble. Photo by Kevin Shields, from Where in Maine? 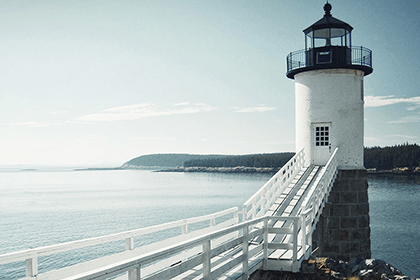 Home to some of the most stunning landscapes and diverse wildlife on the Eastern Seaboard, Acadia National Park is open to explore year-round. Situated on the coast of Maine, the majority of the park’s 47,000 acres sprawls on Mount Desert Island, though portions of the park are on the Schoodic Peninsula and Isle au Haut. Whether you’re interested in visiting Acadia National Park for fall foliage, winter skiing, spring fishing or summer hikes, it’s the perfect outdoor playground. Many people begin their exploration of the park at the headquarters or the Hulls Cove Visitor Center. To enjoy the park with fewer crowds during peak summer months, try an alternative entrance like the Welcome Center at Rockefeller Hall on the Schoodic Peninsula. Read on to learn more about Maine’s only national park. The park is about 160 miles from Portland, Maine, and about 50 miles from Bangor, Maine. The town of Bar Harbor, located on Mount Desert Island, shares borders with the park and is a popular home base for those visiting the park. 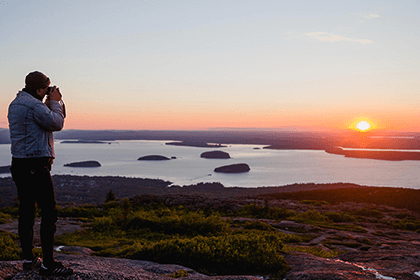 When you’re planning a trip to Acadia National Park, rest assured there’s no shortage of summits, hiking trails and natural beauty. Here are just a few of the many must-see places on Mount Desert Island and beyond. For half the year, this mammoth mountain is home to the first rays of daylight to touch the United States, and the perfect place to catch the sunrise year-round. 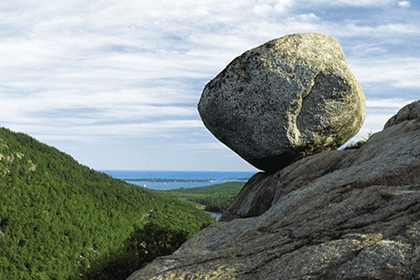 Considering the sheer scale and beauty of the mountain (it’s the tallest on Mount Desert Island and the Atlantic Coast), it’s no wonder why it attracts so many visitors. If you’re hoping to avoid the crowds (and a bit adventurous), try hiking the trails in winter. The solitude and snow-kissed scenery are worth it. If you find yourself along the coast of Mount Desert Island and hear thunder but don’t see a cloud in the sky, you’ll know you’ve arrived. 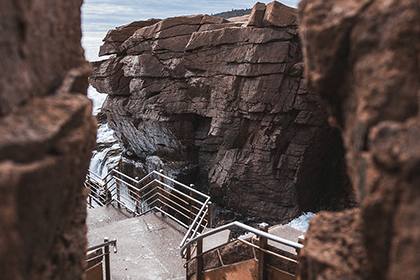 Coastal stone and immense ocean waves conspire to produce a booming show at Thunder Hole, a natural inlet that’s a popular attraction for first-time visitors. Four miles long and 113 feet deep, Great Long Pond on Mount Desert Island is popular for boating, canoeing and fishing. Be sure not to confuse it with Little Long Pond in Seal Harbor. Mount Desert Island’s dramatic, rocky coastline gives brief way at Sand Beach. Though the ocean water is chilly even in summer, the soft inviting stretch of sand is popular for picnics and close to coastal trails, like the Ocean Path. 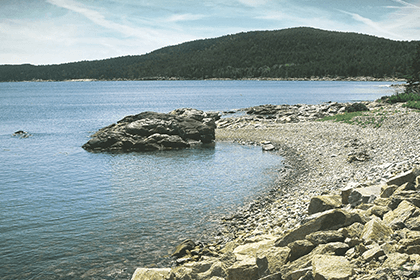 This picturesque island, about half of which is designated Acadia National Park land, is accessible only by mail boat from the town of Stonington. 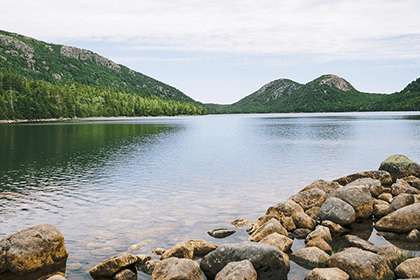 There are five rustic campsites available for reservation, and eighteen miles of hiking trails that present a new perspective of Acadia. This lesser-used section of the park offers awesome views of the Atlantic Ocean and Mount Desert Island in the distance. Explore Schoodic Loop Road’s 8.3 miles of one-way bike paths with incredible scenery on tap. Whether you’re looking for family-friendly things to do or a challenging solo hike, there’s something for everyone in the park. 120 miles. 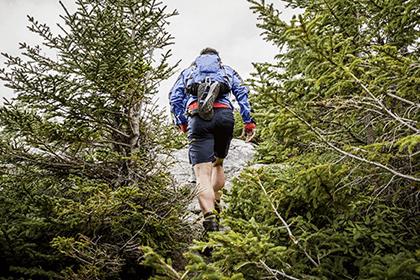 That’s the total distance of mesmerizing hiking trails—ranging from easy strolls to strenuous endeavors—zigzagging through the park. Start planning your Acadia hikes. The parks impressively diverse ecosystems are home to equally diverse wildlife. Birders will find themselves in a state of bliss with roughly 300 species to keep an eye out for, including the meteoric peregrine falcon. If you’re hiking the coast, you might get lucky and spot a seal. Cold water and warm water. Fresh water and ocean waves. Anglers can cast for a variety of species in diverse terrain. Hook cold-water fish like landlocked salmon, brook trout and brown trout or chase warm-water species like smallmouth bass. 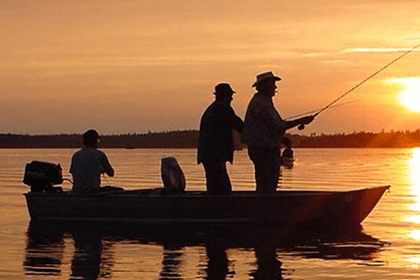 Learn more about fishing in Acadia National Park. Sometimes, all it takes is two wheels to get the most out of your park experience. 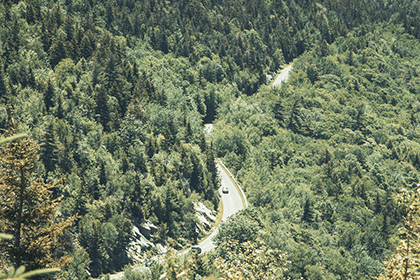 Cruising the 27-mile Park Loop Road (that takes you past many of the park’s highlights) or the nostalgic 45 miles of carriage roads, you can acquaint yourself with much of the park in just a day or two. 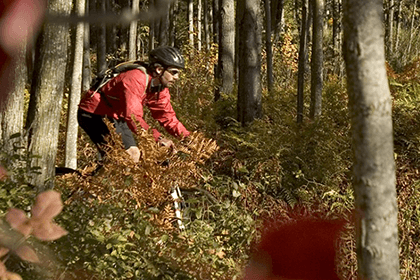 Bike rentals are available in nearby Bar Harbor. 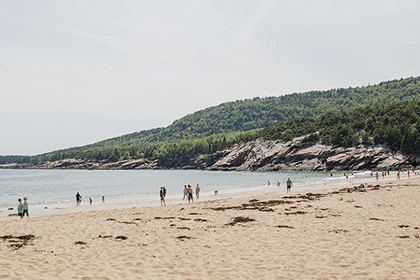 From classic tent camping to modern RVing, a variety of campsites can be found on Mount Desert Island, the Schoodic Peninsula and Isle au Haut. Some are even available year-round. Many campsites have bathrooms with running water and showers close by, though you can rough it at more primitive campsites. 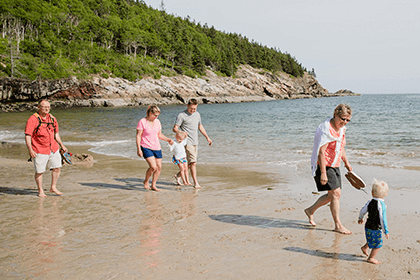 If you’re not sure where to stay but want to enjoy the park by day and comforts of town by night, you can find inns, cottages, hotels and more in towns like Bar Harbor, Ellsworth, Southwest Harbor, Tremont and more. Find the park’s seasonal hours and information on fees and passes below. If you’re driving to the park, keep in mind that some lots do not accommodate RVs or trailers. 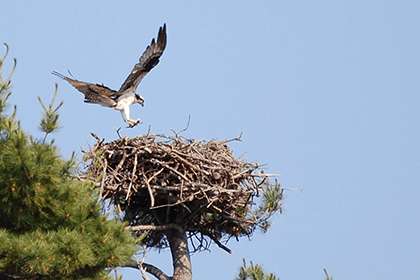 Check out upcoming park events like guided wildlife viewing, and tours.